I wanted to make something quick and delicious to make on these crazy busy summer nights. 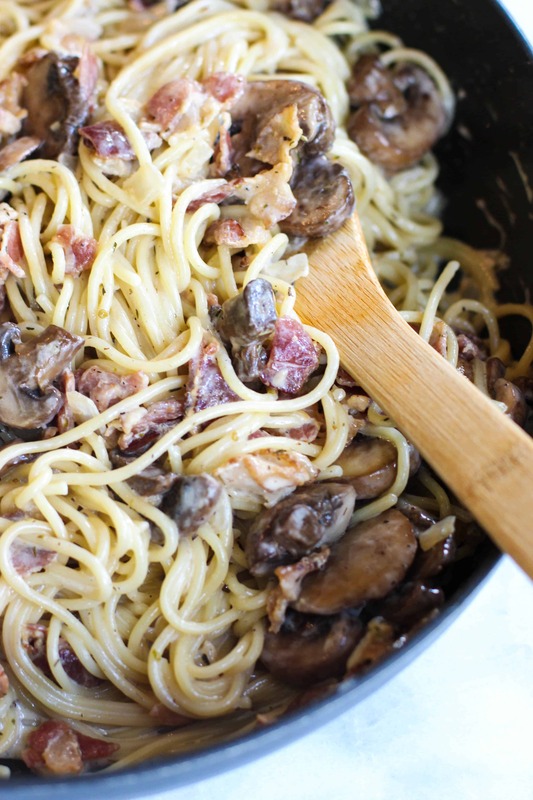 Cue this Mushroom, Bacon, and Parmesan Spaghetti. It’s so decadent and filling, but super quick to make! 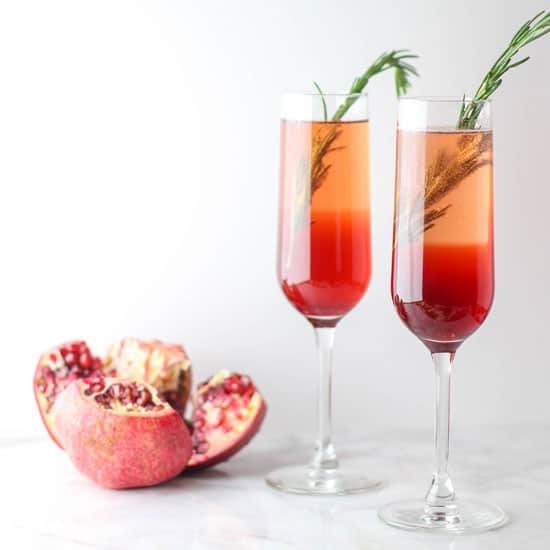 I love the fact that there’s only a few ingredients, but they bring big flavor. 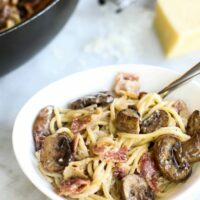 The combination of mushroom and bacon has a new place in my heart that I think I’m going to have to fill with more recipes. They just compliment each other so well! Add that with a parmesan cream sauce and you’ll have anyone hooked! It’s only heavy cream and grated parmesan that melts together to make this wonderful creamy sauce that’s thick sticks to the pasta. I want more just thinking about it. Insert a few heart-eye emojis here, folks. You could technically drain the saute pan of all of the bacon grease once you’re done cooking the bacon and use something like olive oil instead. I thought about it.. and quickly decided against it. All the flavors just mix together so well and pick up the bacon-y goodness. Just imagine the smell of garlic and onion cooking in bacon grease. It’s probably the quickest way to cook something that smells like a professional is doing it. Anddd it’ll bring everyone to the kitchen to investigate what you’ve got cooking! I experienced this first hand while making it. 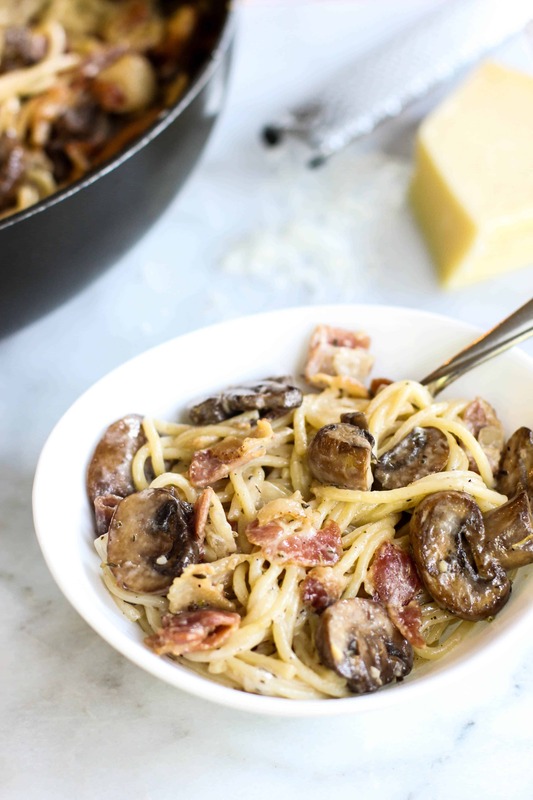 If I haven’t convinced you yet, you can make this in one pot! Just cook the spaghetti in a large pot. 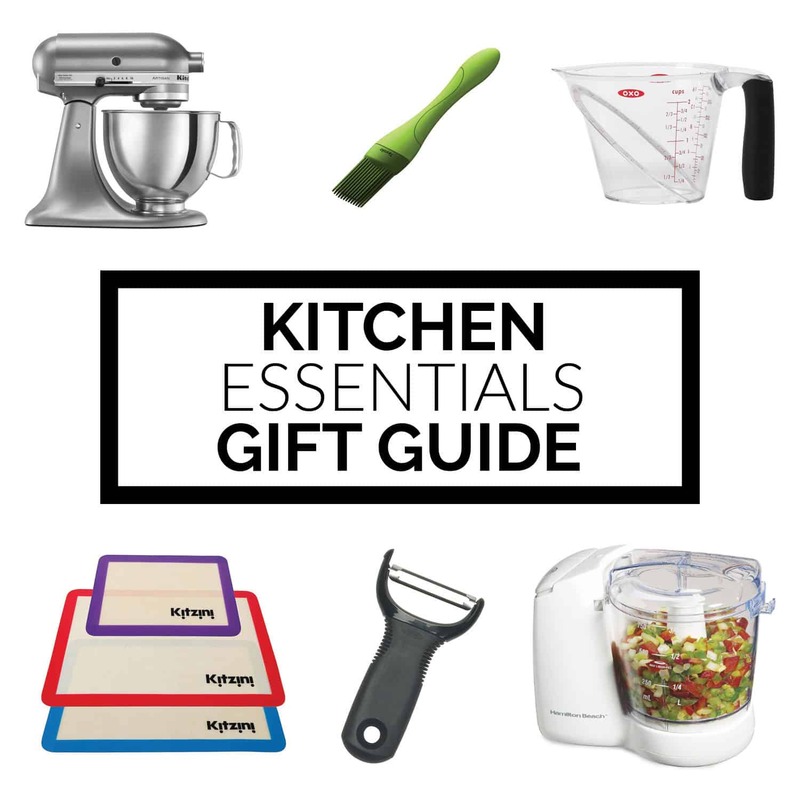 Prep the other ingredient while that’s cooking. Drain the spaghetti and set aside. Use that pot and continue the directions from there! Nothing like a delicious meal and as few dishes as possible to clean up afterwards! Bring a large pot of water to a boil. Cook spaghetti 10-12 minutes until done. Drain and set aside. 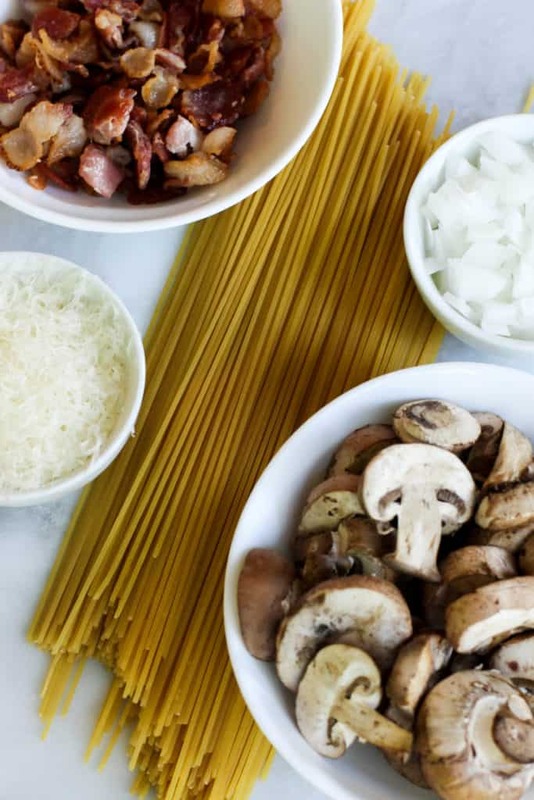 While spaghetti is cooking, cut bacon into bite size pieces and cook over medium heat in a large saute pan until done, about 8-10 minutes. 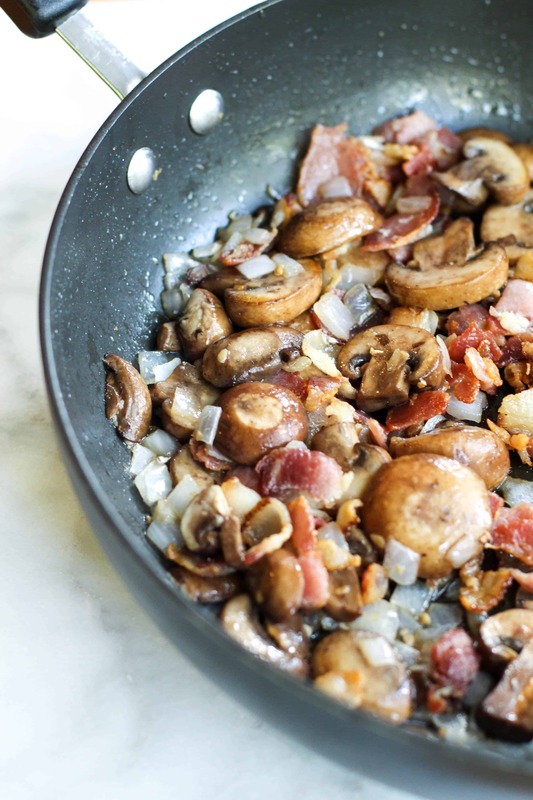 Remove bacon from pan and place on a plate. Add in garlic and onions and cook 5-6 minutes until onions are soft. Add mushrooms and cook another 3-4 minutes until they are tender. Add in the bacon. Change heat to medium low. Pour in heavy cream and stir well. Slowly add parmesan, salt, pepper, oregano, and thyme, and mix to ensure it doesn't clump. Let simmer 2-3 minutes to thicken. Add pasta and stir so it's fully covered. Serve warm and enjoy!